The path to today’s Kenyan coffee was not an easy one. It began when Arabs forced thousands of Kenya’s people to work as free labor on coffee plantations around Kenya and Arabia. When the British took over control of Kenya in the 1900s, they decided certain crops should be grown by white settlers and Kenyans should work as slaves or for extremely meager wages. In the 1930s, the African farmers became more powerful. As a result, the Europeans banned them from growing coffee. The British finally lost control in 1960 after the Mau Mau Uprising. The Kenyans were then allowed to grow coffee, but with restrictions on how much they could grow and how they could use the beans. Kenya’s finest coffee was exported and only the lowest quality coffee was available locally. Sadly, for generations the locals never knew what great coffee they were producing and even today coffee farmers aren’t earning proper wages. Yet, despite its historical coffee production struggles, today Kenyan coffee is thriving. In only the last 15 years new reforms have made it so that coffee farmers can do whatever they wish with their coffee penalty-free. There are approximately 700,000 coffee producers in Kenya right now. The amount they process and consume is under their control. Kenya is currently 16th in worldwide coffee production. Their annual production varies because of the climate and socio-economic factors but is usually around a million bags per year. The vast majority of coffee produced is exported. For example, in 2015 they exported 94% of the coffee produced. Their coffee has strict regulations and a unique democratic auction system run by the government’s Kenya Coffee Board. Each week, samples of every coffee lot are open to bidders. These bidders enter auctions for any lot they want and the highest bidder wins. This is all transparent so that the best coffee earns the highest prices. Because of the warm climate, high altitude, and rich red volcanic soil, these regions are great for producing arabica coffee. Unlike most places where coffee is grown, annual precipitation there is over 1,000 mm (35”). All of Kenya’s coffees are sorted after harvest and rated mainly by bean size, but also color, shape, and density. The larger beans are believed to have more essential oils and thus be more flavorful. Sorting coffee helps to maintain consistency within each coffee bag so that consumers know what type of flavors to expect. Although Africa has both Coffea arabica and Coffea robusta, Kenya exclusively grows Coffea arabica. Contrast this with a country like Indonesia, which grows about 75% Coffea robusta. Their coffees are wet-processed green coffees. They’re usually full or medium bodied, with a citrus-like acidity, and winey. They have a complex taste that is sweet and fruity with hints of berries and dried tomato. The most similar type of coffees would be Ethiopian varieties, however, Kenyan coffee is richer than what they create in Ethiopia. Typically, the brews have a strong aftertaste. A specialty in Kenyan Coast cuisine is the Kahawa Chungu (Bitter Coffee) brewing method. To create this, they brew in brass kettles under charcoal stoves. The SL-28 and SL-34 variants are particularly popular. They were named by a company called Scott Labs that the Kenyan government hired to determine which types of coffee would be best for commercial development. The lab discovered over 40 different variants which then received an “SL” for classification purposes. SL-28 and SL-34 were found to be the most drought resistant and highest quality, so they won. The SL-28 is the top favorite because of its acidity with hints of black currant and tomato and a sweet, tropical flavor. Less popular is K7 (which grows at a lower altitude) as well as Ruiru 11 and Batian. Ruiru 11 was created in a laboratory to be rust-resistant. Batian is not only rust-resistant, but also resistant to berry disease and matures quicker than other varieties (two years rather than three). Besides the variety differences, there are also regional variations. Kirinyaga coffee is delicate and floral. Meanwhile, Nyeri coffee tastes more sugary and tart. Embu’s flavors mix together brown sugar and fruits. Depending on your taste preferences, different Kenyan coffee top-sellers may become your favorite. Here’s what you need to know about some of the top brands. Kenya AA Coffee is one of the 10 best coffees in the Africa. Typically they are grown in high altitude and sold as medium roast, single origin coffee. These are some of the most fruity, bright, and floral coffees you’ll try from any country. Great beans. Having spent a month in Kenya with a wide sampling of beans, these beans are right up there in quality. The roast was exactly as I ordered. Well done. Gevalia’s Kenya Special Reserve is grown on the slopes of Mount Kenya and are a single origin roast with subtle berry undertones. This particular roast is sold pre-ground only and is a great option for those who like the convenience of pre-ground coffee, though it should be noted that the best Kenyan coffee beans will be sold as whole bean coffee. I absolutely love this coffee. I use the pour-over method of brewing. I drink this every day and never tire of it. I have recommended this to friends who when they have had a cup agree that it’s a great coffee. Volcanic’a Peaberry coffee has a rich, winey, black currant profile compared to the lighter, fruitier coffee above. Peaberry is the the rarest coffee in the world comes from coffee cherries that develop just one round bean instead of two half-moon shaped beans. The single coffee bean gets all the growing love and develops a more complex flavor. Its their unique flavor and relative scarcity that make them so desirable; peaberries represent around 5% of the coffee harvest each year. 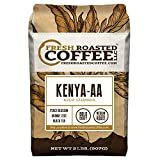 100% Pure Kenya Peaberry Coffee with a full-bodied, sharp acidity with the winy flavor of black currants for a remarkable taste. Single origin estate coffeeen peaberry coffee beans for an incredible gourmet coffee bean. Volcanica is my go-to beans. Always fresh. The Kenya is super strong as it should be. I love your theme here. I have to admit that I don’t know much at all about the different types of coffee beans or their implications. Seems like a complex topic but you’ve done a great job at summarizing it.